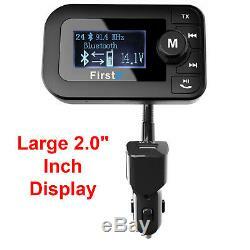 2.0 Bluetooth FM Car Transmitter Wireless AUX Stereo Audio Receiver Radio USB. 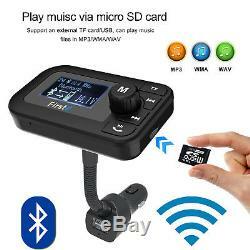 Firste HK105 is one of the most favorite car Bluetooth receiver FM transmitters in the market. It utilizes Bluetooth 4.2 technology, equipped with a USB charger port, a U-disk port, 3.5mm AUX output jack and TF card slot. 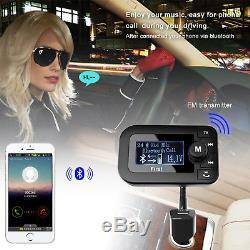 Hands Free Calling: It provides multi-solutions for your hands-free driving and in-car stereo streaming. Support FM & AUX Output. Smartphone can be paired with HK105 Bluetooth receiver by Bluetooth, and streamed throug car FM system or 3.5mm AUX output jack, then streamed to car stereo speaker. Memory Function: Automatically connect to its memorized paired Bluetooth devices once the unit is powered on. Press and hold the mufti-functional button to switch modes, such as TF card mode, U-disk mode, FM mode etc. 2 Adjust car FM to an empty channel (87.5108MHz) with pure rustling sound, then adjust the Firste FM Transmitter to the same frequency. Multi-functional buttoncan not only control volume, but also adjust the FM frequency, easier operation by comparing with other products. 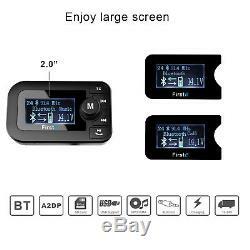 PC scratch proof lens, FM transmitting with no noise. 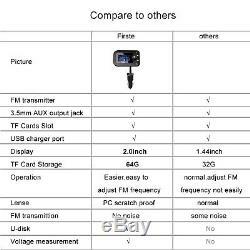 BROAD COMPATIBILITY - FirstE HK105 car fm transmitter works with Bluetooth enabled devices like iPhone, iPad, iPod, Tablet, Smart phones or MP3, MP4 Players via 3.5mm audio jack. Built-in microphone feature can offers you hands free talking and wonderful music. 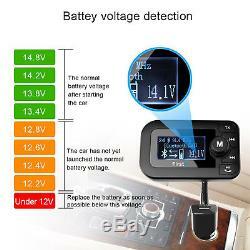 HUMANIZED LARGE LED DISPLAY - Car battery voltage level will be detected and displayed on the big 2.0 inches LED screen when insert this Bluetooth fm transmitter in car cigarette lighter hole; name of songs playing(in shuffle/random and in oder)through TF Cards and U-disk could be displayed, songs via Bluetooth will not display. 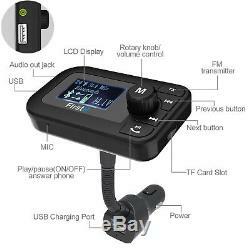 CRYSTAL SOUND QUALITY: FirstE bluetooth receiver fm transmitter utilized most advanced interference and noise cancellation technology, to grant most crystal sound quality. Please be noted, due to radio frequency interference and car ground loop noise, it is almost impossible for any transmitter to produce a perfect audio, but FirstE does one of the best work in the market. FAST CHARGING&FLEXIBLE NECK: With Dual USB Charging port(output 5V/2.1A + 1.0A ; Input 12-24V), which can charge most USB devices, such as apple iPhone 7 6 6S Plus;Android Smartphones, Power Bank etc; Flexible neck ensure an ideal fit in nearly any vehicle, lets you power up your device while talking or streaming music! MORE SURPRISES: Built-in microphone feature supports hands-free talking; support TF/MicroSD Card in FAT format up to 64G; Support A2DP(achieve the stereo music lossless transfer to your car speaker);support MP3/WMA/WAV format; support 3.5mm AUX output. We don't accept P. BOXES - please provide a physical address! Or check out more of our products on. 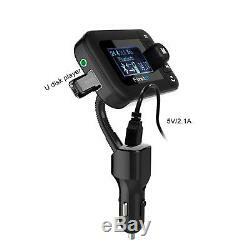 The item "2.0 Bluetooth FM Car Transmitter Wireless AUX Stereo Audio Receiver Radio USB" is in sale since Thursday, February 15, 2018. This item is in the category "Computers/Tablets & Networking\Home Networking & Connectivity\USB Bluetooth Adapters/Dongles". The seller is "best_selling_products" and is located in Denver, Colorado. This item can be shipped to United States.